Ensuring the right care is provided to the right patient is an essential part of providing and receiving safe care. Unfortunately, this does not always happen. The failure to correctly identify patients and match that information to an intended treatment or intervention continues to result in procedures being performed on the wrong person, wrong side or wrong site; medication errors; blood transfusion errors; and errors in diagnostic testing. * 4. How many incidents were reported in Datix CIMS in 2017 for RPBG related to patient identification and the wrong patient? At a minimum when are these core identifiers to be used? On registration or admission, and handover. When care, therapy or treatments are provided. On registration or admission, when care, therapy or other services are provided and whenever clinical handover, patient transfer or discharge documentation is generated. * 6. RPBG regularly audits compliance to patient ID and the three core identifiers. Where can you find your area's results? Ask your department or ward manager. On the front page of the RPBG Hub, by clicking on the Ward Quality Dashboard icon. * 7. You have identified a patient with an incorrect band. What procedures should you perform? * 8. 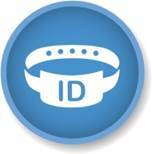 You are caring for a mental health patient where it is inappropriate for that patient to wear an ID band. What is the order of other forms of identification for this patient? 1. Photographic identification in the health record, 2. sight identification by two staff members who record this in the patients medical record. 1. Verbal identification checked against the medical record, 2. sight identification by two staff members who record this in the patients medical record, 3. Photographic identification in the health record. 1. Sight identification by two staff members who record this in the patients medical record, 2. Photographic identification in the health record, 3. Verbal identification checked against the medical record. 1. Verbal identification checked against the medical record, 2. Photographic identification in the health record, 3. Sight identification by two staff members who record this in the patients medical record. * 9. Which of the following statements about Patient Identification in the outpatient/community setting is correct? A verbal patient identification check against three core identifiers is only required at registration and initial appointments, not at follow up appointments. A verbal patient identification check against three core identifiers is only required at registration. A patient sticker in the notes for follow up appointments is sufficient- no need to ask. As long as someone has done a verbal identification check against three core identifiers on the same day, I don’t need to.